As part of World Coal's Handling Week 2017, Harold A. Walker and Donna F. Walker, PICOR, USA, explore the dangers of hatches and hatch covers on ocean-going coal vessels and how a new technology could avoid such risks, reduce costs and improve safety. "A new wave of technology "
Coal and other fossil fuels are under international political pressure due to the acceptance by many politicians and environmental groups of the negative effect carbon dioxide emissions have on the environment. This pressure will result in a difficult coal market for the short term but increasing demand for energy will require the total energy supply to increase in the long term. Those with an investment horizon in excess of ten years would do well to plan and build before then. Ocean-going bulk carriers transport around 1 billion tpy of coal. These vessels are built in many sizes – generally determined by where they will be operating. 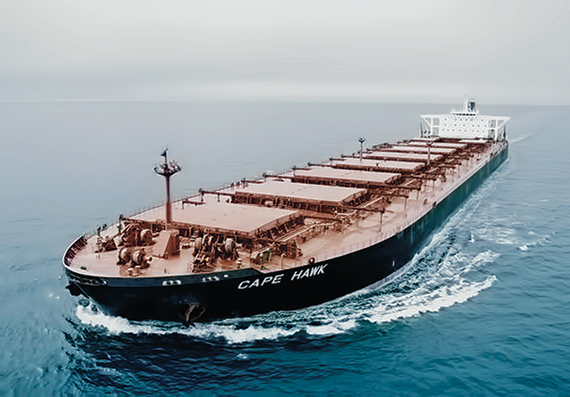 Handysize vessels are generally designed to carry 40 000 t – 45 000 t, panamax vessels are designed to traverse the Panama and Suez Cannels and carry 60 000 t – 80 000 t, and vessels designed to travel round the Cape of Good Hope and Cape Horn generally carry over 80 000 t. Ocean transportation of coal is extremely economical but there is room for improvement. Figure 1. Hatch covers on weather deck. Coal loaded onto ocean-going bulk carriers is generally loaded by clamshell buckets or other types of equipment through hatches above holds, which contain the coal during shipment. At the destination port, most ocean-going bulk carriers are unloaded by clamshell buckets or some other device through the same hatches. During unloading, it is necessary to lower mobile equipment into the holds to physically move some of the coal into an area that can be reached by the unloading equipment. While this process is accepted as normal, it does have some consequences that make it less than desirable. Figure 1 is a typical vessel that would transport coal. The hatches and hatch covers are very evident. Figure 2. 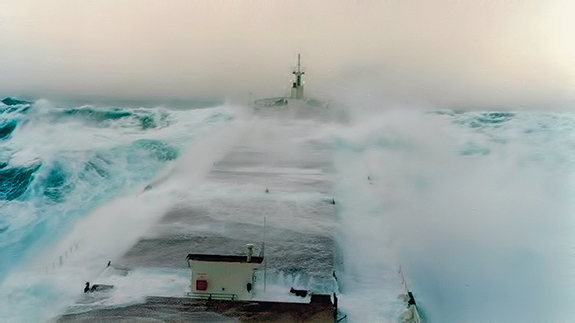 Bulk carrier in rough seas. Hatches on the main deck of a vessel create two problems. The hatches must be large enough to allow access to load and unload the holds. The hatch covers must be sufficiently robust to prevent deformation and ingress of water even when subjected to the force of large breaking waves. To be large enough to allow sufficient access to a hold, the hatch must comprise a large percentage of the total area of the hold. Since the size and number of holds constitute most of the weather deck area of an ocean-going bulk carrier, hatches – and therefore hatch covers – are a large percentage of the area of the weather deck. These requisite large hatches in the weather deck adversely affect the structural integrity of the vessel, requiring the naval architect to add significant structural reinforcement to the weather deck. Additionally, large robust hatch covers add significant weight, machinery and cost to the vessel. Figure 3. Ocean wave breaking. Sealing large hatches against leakage is a significant problem. 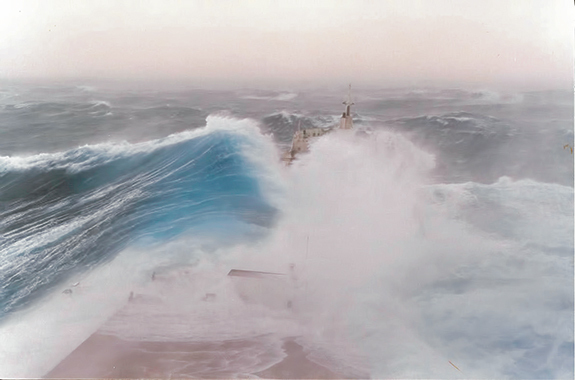 The ocean, especially during storms, is subject to large random waves that cause even large vessels to roll and pitch. The vessels are made of steel, which deforms as it is stressed in rough seas. The hatch covers, not being an integral part of the vessel, do not deform in the same manner as the weather deck. In rough weather, this difference in deformation makes it difficult to fully seal the hatches making them subject to leaks. In very rough weather, the hatches can also become overstressed and fail structurally. It is not unusual to encounter sea states that cause the bow of a vessel to submerge, shipping many tonnes of water aboard the weather deck. If, when the vessel’s bow is submerged, it is hit by a breaking wave, very large loads can be imposed on the hatch covers. When in storms of this severity, it is also not unusual for a ship to roll significantly. In such a storm, the survival of the vessel may well depend on the security of the hatch covers and stability of the load. If a forward hatch cover fails, it is highly probable the vessel will take on enough water to sink by the bow. If the hatch covers leak, it is possible to take on enough water to partially liquefy the coal, making it easy for the load to shift dramatically, changing the trim of the ship. A ship negotiating a strong storm at sea on an even keel has little chance of survival if, due to a shifted load, it incurs a significant list. Over the years, ingress of salt water into areas not easily detected can corrode and weaken the structure of a ship. The unloading of a vessel by means of clamshell buckets and end loaders or dozers will inevitably damage the epoxy coating installed on the inside of a hold to protect against corrosion. Coal and saltwater are very effective corrosive agents to unprotected steel. A vessel weakened by corrosion may fail structurally without warning in seas that it would normally withstand. Lloyd’s Register, the British classification society, issued warnings in 1990 and early 1991 concerning dangers to the ageing fleet of bulk carriers from corrosion in cargo holds. Some unexplained losses of large bulk carriers have occurred within minutes resulting in the loss of all hands indicating a large instantaneous rupture of the underwater hull. This is consistent with weakening of the hull by corrosion. Figure 4. 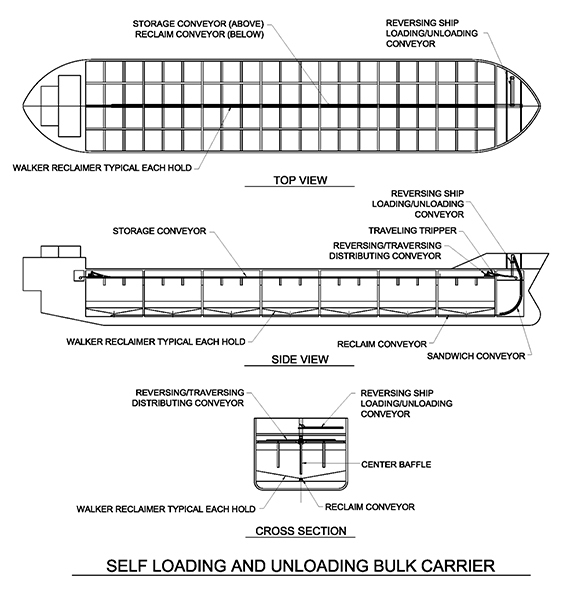 Self-loading and unloading bulk carrier. The capesize bulker IOLCOS VICTORY (74 278 GRT, 132 597 DWT), loaded with iron ore from Tubarao to Singapore, sank on 9 September 1996 one hour and twenty minutes after the crew ascertained the flooding of forward holds during bad weather off South Africa [emphasis added]. Most crew members were saved by a fishing boat, but five died. WALKER, H. A & WALKER D. F. 'Moving Forward', World Coal, Vol. 25 No. 3 (March 2016), pp. 60 – 64. This is an excerpt from an article that was first published in World Coal June 2016. To register and receive your free trial of the magazine, click here.